Loader won’t lift like it should? Backhoe won’t dig in that hard clay? Get all the capability designed into your machine! This complete kit allows quick and easy testing and adjustment of your hydraulic system pressure. 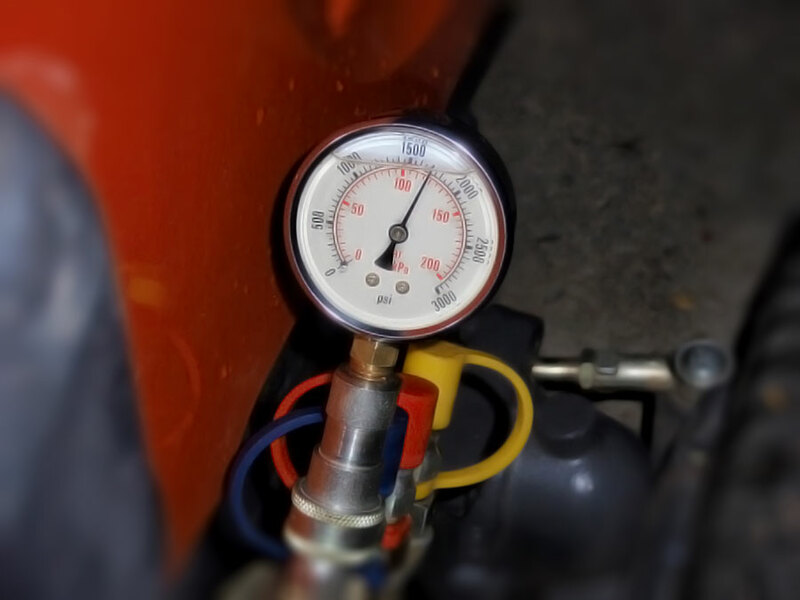 Lets you make a pressure check an easy part of your periodic maintenance routine. Recognize the inevitable weakening of the Pressure Relief Valve spring and correct the gradual decrease of hydraulic pressure. The BXpanded Pressure test kit includes everything you need to test your hydraulic system pressure in seconds. Hydraulic quick connector snaps leak free onto your loader valve output. ASME “Class A” accuracy gage provides reliable readings. Assembled with approved Hydraulic System Thread Sealant to avoid the possibility of contamination with loose Teflon tape, etc. The kit includes a selection of precision shims to allow adjustment to manufacturer’s pressure specification. Instructions are provided to guide you through the test and adjustment process. The kit is available for BX, B, TLB, and L series Kubota tractors. Input your Kubota tractor model into the "Tractor make/model" box on the checkout page (required for checkout so you won't miss it!) so we can ensure the correct kit is sent. Not compatible with the BX22, BX2200, BX1800, or BX1500 in which the loader valve is removed with the loader. Bought my BX back in 2007 and have over 600hrs on it. So glad I got this kit over others online. Everything is included, good instructions, nice packaging. Fixed my pressure and got it back in range in about 20 minutes. I used this kit to quickly and easily adjust the pressure on my B2650. Mine seamed to be weak, so using this kit I verified that the hydraulics were set at the very bottom of the pressure range. There were no shims from the factory, so after inspection the pressure and referring to the work shop manual I added shims to bring the pressure up to the high end of the approved range. This made a really big change in loader performance! If you have a BX or a B unit, you really owe it to yourself to get this kit and bring your machine up to it's performance potential. This is the best $69 that you'll invest in your tractor accessories! Order it, trust me... You'll love it! Shipped right away, nicely put together kit with instructions that were clear and thorough. A quick and simply fix to bring my machine back up to spec. Although the original kit wasn't specifically designed for my tractor/loader/backhoe (Kubota L3700SU/BH77/LA463) combination, I ordered it anyway and locally picked up the larger (3/8") quick connect coupler and 1/4" to 3/8" inch adapter. 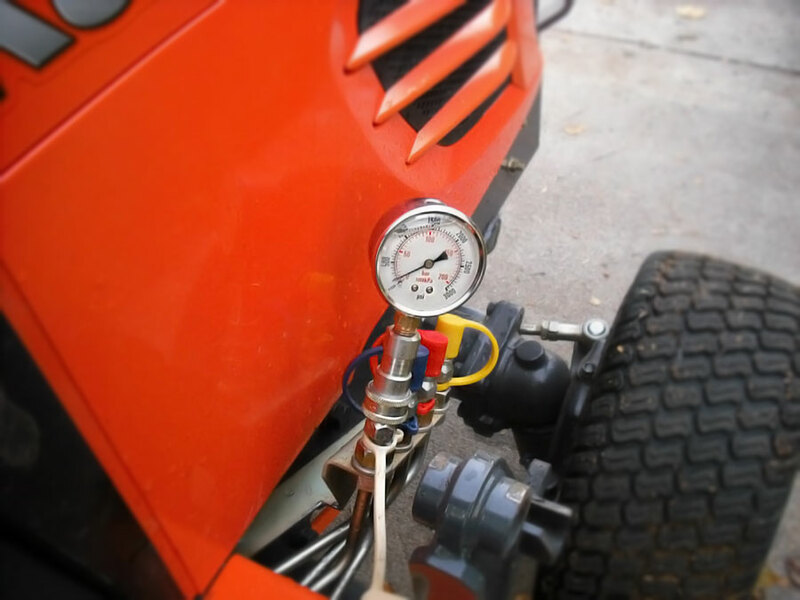 With the easy to follow directions and a little insight from the BXPANDED.com team, I was able to quickly install the pressure gauge, verify that my tractor had never been performing to its potential, then proceeded quickly to shim the relief valve to put it in spec. I haven't yet reattached my backhoe but the loader finally digs into a pile of gravel without hesitation, then lifts and rotates as I always thought it should. If you don't have this kit, or haven't checked your pressure settings, you are probably missing out. I feel this kit saved me many thousands of dollars because I had been considering a new tractor to to the work this one should have been able to do all along. Great kit, great buying experience, and I am a customer for life. Now... just have to decide which of their tools I need next!! Tester works great ,Loader is amazing since i ajusted the pressure!!! I just used the kit to check the pressure on my BX25D and as expected found it was significantly below spec. The process of adding shims was quick and easy (good directions included). Set pressure at 1800 psi. What a difference! The loader, with the bucket expander, is much more powerful. Making faster work of my 35 cu yd pile of mulch. Great tool and a great result. Money well spent. A: It does fit the new 80 series including the BX23S. We are now offering it with the flat face connector which will fit them.